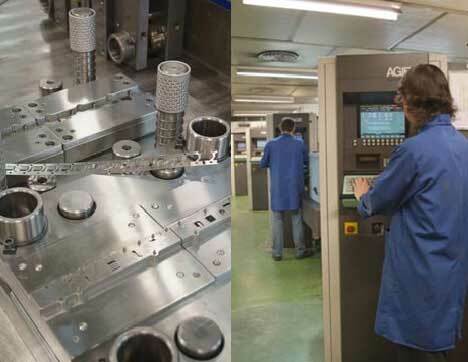 Maprex (MATRIUS DE PRECISSIÓ S.A.), is a Spanish company placed in Sabadell and more than 30 years working in dies industry, and specialized in design and production of high-precission dies. Maprex also provide serial metalic parts for main customers in automotive industry and selected Fikus Visualcam as the solution for wire EDM. Maprex produces dies for automotive, electronical and consumtion industries. The company is certified as offical provider of main car makers. Maprex designs and produce its dies and is highly commited with quality. Maprex is currently working with AGIE 250HSS machines and also with last generation of AGIEVISION Classic V3 to carrie out all the required operations in dies cuts. After a deep study of the wire EDM CAM solutionss in market, Maprex selected Metalcam and Fikus Visualcam as CAD/CAM solution for programming their wire EDM machines. By using Fikus Visualcam, Maprex has reduced the machining programming time up to a 30% thaks to tha efficient Wizards and all the technology included in the system. Another decisive factor to select Fikus Visualcam is the technological databases included in Fikus for almost any machine. This way user can work together with machines technological data and other user technologies ensuring that machine will work with exactly the same CAM values. David Dapena, responsible in Maprex management, said that: "To use only one programming system for different machines has alowed us unify all the productive process. We are specially satisfied about the posibilities that Fikus offers in dies parts. By using the non-core cycles the machines can work alone in the nights safety".